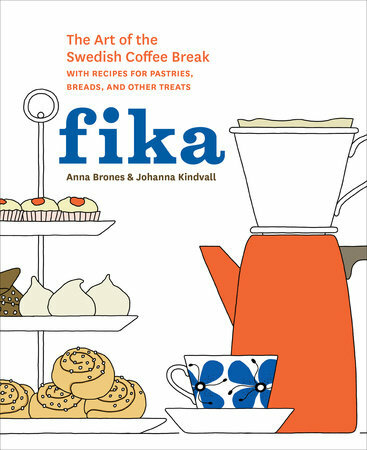 Fika: The Art of the Swedish Coffee Break with Recipes for Pastries, Breads, and Other Treats is a newly released cookbook from Anna Brones and Johanna Kindvall focusing on the Swedish idea of taking a moment in the day to relax with a cup of coffee and homemade treat. I love finding books that give me a historical and cultural overview in addition to the recipes and Fika does not disappoint. I am not personally a coffee drinker, but giving myself a little time in the morning and afternoon to enjoy a freshly baked snack with a cup of tea definitely helps me recharge before the chaotic hours of juggling dinner, baths, and bedtime. Chapters include the Introduction; A History of Swedish Coffee; Modern-Day Fika; The Outdoor Season; Celebrating More than the Everyday; and Bread, Sandwiches, and Fika as a Snack. The introduction explains Fika (pronounced “fee-ka”), staple ingredients, tools used in baking, and specific cooking methods. The history of Swedish coffee discusses the evolution of coffee from the first importation to the development of konditori, traditions, and cookbooks surrounding the ritual. Modern-day fika covers the tradition today and some of the more recent treats that have developed. The Outdoor Season offers a few recipes perfect for a picnic and ways to use summer produce. Celebrating more than the everyday focuses on the popular holidays in Sweden- Name Days, Fat Tuesday, Midsummer, Birthdays, and the Christmas Season. While most of the recipes are sweet-based, the last chaper offers more savory snacks. For those who want cookbooks full of photographs, this may not be the book for you. In place of photos, Fika is filled with beautiful and detailed illustrations by Johanna Kindvall (check out her blog for examples) for each recipe. I am usually one who looks for the photographs in cookbooks, but they were not missed here. The illustrations do a great job of giving a visual aspect to the instructions, especially for the more intricate baked goods. The authors stress using the best ingredients (and natural/organic) available to create quality baked goods. For ingredients that are difficult to find in the United States, homemade versions are offered along with substitutions when needed. For the most part, no special tools are required other than a food processor and grinder/mortar and pestle. In addition to American measurements, dry ingredients are also listed in ounces and grams. Most of the recipes don’t skimp on the butter, but I like to practice consuming these delicious treats in moderation. 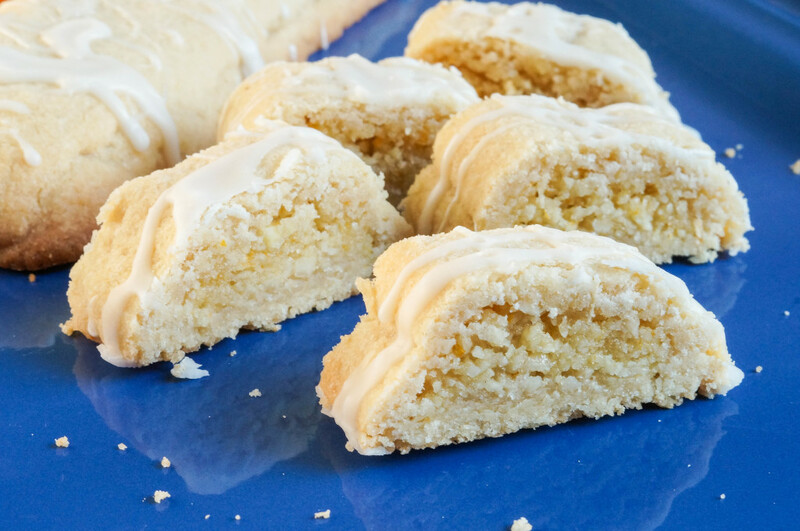 The first recipe that caught my attention was Apelsinsnittar, sliced cookies filled with an orange almond paste and drizzled with a light orange glaze. They were fairly easy to make and quite addictive. The dough is a bit fragile and tore a little for me as I covered the filling, but it was easy to gently form back together after I transferred the log to the baking sheet. The recipe makes about 48 cookies, but they store well in the freezer. 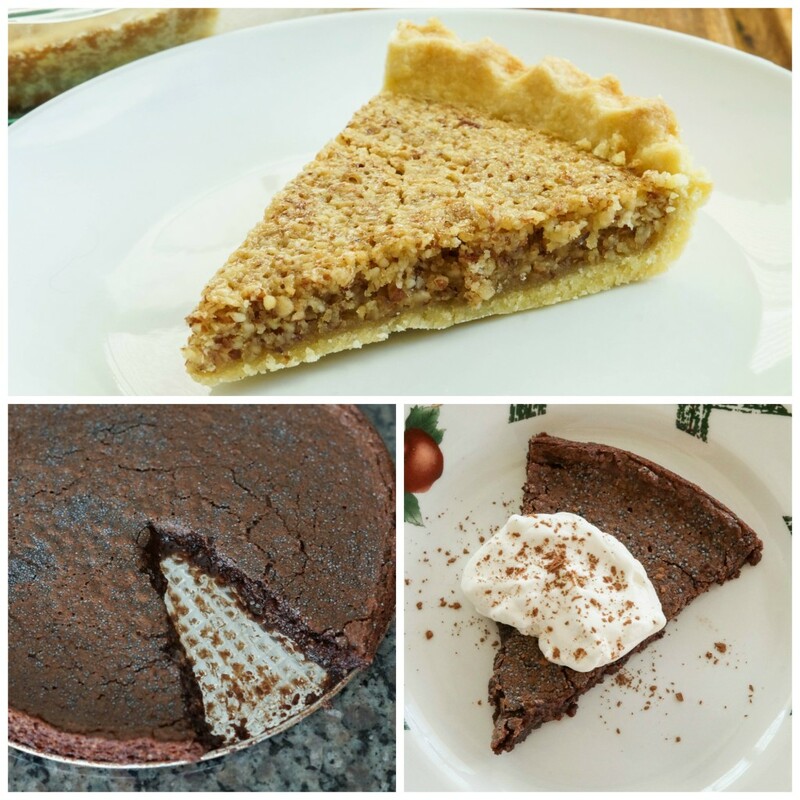 Other recipes I have tried include Mandelkaka (Almond Tart) and Kladdkaka (Sticky Chocolate Cake). Both were absolutely delicious. I’m slightly embarrassed to say that I made the Mandelkaka on a Thursday and it was gone by Sunday (I was the only one around to eat it at the time). I made another Kladdkaka last year, but enjoyed this version too. It uses ground almonds instead of flour and the top is sprinkled with poppy seeds before baking. This is one of the few cookbooks I own that I see myself making nearly every recipe (though I probably need to space them out to save my waistline). Evan doesn’t generally enjoy sweet treats, but he loves helping me assemble them. I definitely see myself pulling out this cookbook often for our morning baking projects. To make the dough: In the bowl of a stand mixer fitted with a paddle attachment or a large bowl, beat together butter and sugar until light and fluffy. Mix in the flour, egg yolk, and ground ginger. Form the dough into a flattened rectangle and wrap in plastic. Refrigerate for 30 minutes. Preheat oven to 400 degrees F. Line a baking sheet with parchment or lightly grease. 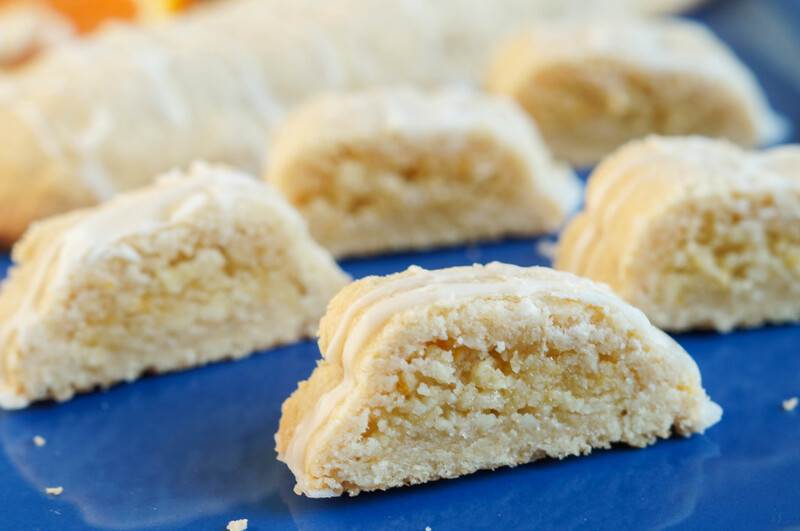 To make the filling: In a food processor, add almonds, sugar, and almond extract. Process until well ground and combined. In a small bowl, beat egg white until frothy. Add the orange zest and mix with the ground almond mixture. On a lightly floured surface, divide the refrigerated dough into 4 equal pieces. Cover three pieces and place in the refrigerator. Place remaining piece on the floured surface and roll into a rectangle, about 10 inches by 4 inches. Gently arrange the rectangle so the longest side is facing you. Place 1/4th of the almond filling across the lengthwise center of the rectangle, leaving 1/4 inch on each side, plus the top and bottom third of the rectangle empty. Gently cover the filling with the top third of the dough, then the bottom third. Pinch the seams to close. Carefully transfer to prepared baking sheet, seam side down. Pinch in the ends to close in the filling and any areas where the dough has torn. Repeat with remaining dough and filling, arranging the logs on the baking sheet 1 1/2-2 inches apart. Bake in preheated oven until the bottoms of the logs are golden, about 15 minutes. Allow to cool on baking sheet. 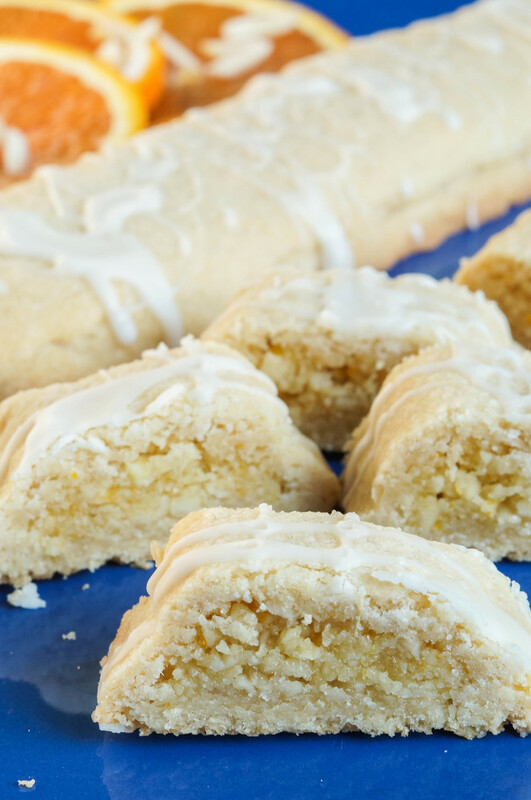 In a small bowl, slowly whisk orange juice into powdered sugar until icing forms and is just thin enough to drizzle. Drizzle or spread across the cooled logs. Allow to set. Once the icing has hardened, transfer a log to a cutting board and cut into slices 3/4-1 inch thick. Store in airtight container or freezer.